It’s incredibly hard to keep an archive of all your organization’s stories (I cannot tell you how much time I’ve spent scrolling through archived blog posts trying to find the perfect story…). So, I created a Digital Story Bank. 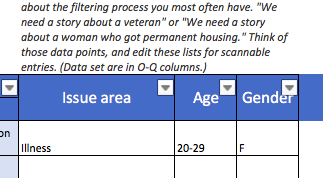 This is a simple Excel document that allows you to collect all your stories in one place, customize each story depending on audience, and filter your stories based on crucial data. It’s fully customizable and doesn’t require any new software. Just a simple solution made by someone who’s worn all the hats. And you can download it for free. Make each story more effective by customizing it for three core audiences and goals. Just fill out the below contact form and I’ll send you an e-mail within 24 hours to download your very own Digital Story Bank! I will never share your e-mail with anyone else.